Photographs of the final dish. Mr. Scrumptious told me once that he loves chicken pot pie and that he had the "best" of his life at a restaurant in Chicago. Since that day, I've been on a quest to beat it, outdo it, make one that he qualifies as the Best. Unfortunately, he doesn't have the culinary memory that I do and can't tell me exactly how it was made and what about it was so sublime. He also doesn't remember the restaurant. If any Chicagoans are reading this and you know the place that's famed for its Chicken Pot Pie, please enlighten me. I'll fly out just to sample it. And then promptly, try to re-create it. While this doesn't surpass his ultimate favorite, this one is apparently a VERY close runner-up. He gave it an 8 out of 10. (No one ever gets a 10 by the way). Here is my variation on the "Almost Ultimate Chicken Pot Pie". 1. Prepare the Cream Cheese Pastry (below) and refrigerate. 2. Meanwhile, prepare all the vegetables and cooked chicken and stock. Preheat oven to 425˚F. In a large frying pan, melt 3 T. butter over medium-high heat. Add the onion and sweat until soft, about 4 minutes. Add the carrot, potato, zucchini and continue cooking another 4 minutes. Next, add the asparagus and celery and stir together. Season with a pinch of kosher salt and ground black pepper. When vegetables are becoming slightly soft, add the mushrooms and thyme. Cook until the mushrooms turn brown and begin giving off their liquid. Add the peas and 1/4 c. white wine and scrape any bits that may have carmelized. Add the Stilton cheese and stir to incorporate. Taste again, adjust seasonings (remember you'll be adding stock though, which has varying degrees of salt. Go easy on salt here). Turn off heat when vegetables are softened but still have some texture and set aside. 3. Melt 3 T. butter and the flour in another large saucepan to make a roux. Cook the roux about 2 minutes, until you smell a good nutty aroma and not the raw flour smell. Whisk in the stock and another 1/4 c. white wine, bay leaf, parsley and salt or pepper to taste. Simmer until sauce has thickened, about 3-4 minutes. Add the cooked chicken and stir through to incorporate. Remove the bay leaf. Add the cooked vegetables and stir to mix thoroughly. Transfer to a baking dish to let the filling cool while you roll out and prepare crust. 4. Roll out the dough to a size 1 inch larger in diameter than the baking dish, to a thickness of 1/4". Pour the filling into your vessel. I like using individual French onion soup crocks, they're perfect! Press the pastry dough over the top of the baking vessel and crimp around the edges. 5. Beat the egg with 1 T. cold water and brush the egg wash on the surface of the pastry dough. With a sharp knife, put a few slits in the dough to vent the steam. 6. Bake for 15-18 minutes, until the dough has risen and begun to brown. Turn down the heat to 350˚F and bake for another 10-15 minutes until the dough is a deep brown. Remove from the oven and let cool 5 minutes before serving. For the crust I used a dough recipe from Mitchell Davis in his cookbook Kitchen Sense. While I rarely cook with others' recipes, I do often bake with them since I'm not nearly so accomplished a baker. This dough was terrific and very light, flaky and delicate. It is similar in texture to those you get with lard or shortening but without that pure animal-fat or greasy taste. I found it much better than others I've tried and it was also extremely easy to roll-out. I had nearly perfect-circle-Food-Network-dough whereas usually it looks like a kindergarten project. 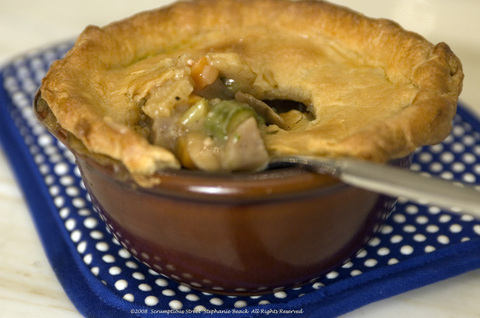 For the pot pies, you use half the recipe. I froze the other half and used it for a lovely tart you'll see in my next post. Here's Mr. Davis's recipe for his Cream Cheese Pastry. 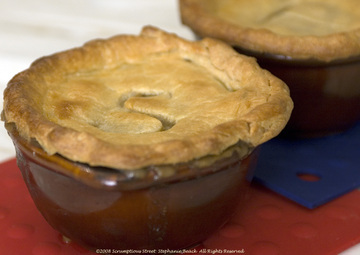 Full recipe here, for pot pies use half! 1. In a bowl, blend the butter and cream cheese until combined. 2. Add the flour and work to a smooth dough. 3. Form into a ball, wrap in plastic and refrigerate at least 1 hour, or until firm enough to roll out. Note: The dough will keep in the refrigerator for three days or in the freezer for up to six months. Defrost overnight before using. I think I'm still in my "nothing-sweet-post-holiday-rebellion" and am coming out of it in stages. I had some beautiful fresh Bing cherries in the fridge, that were on the verge of being too ripe. The challenge was what to do with them that didn't involve drowning them in syrup or sugary coverings. 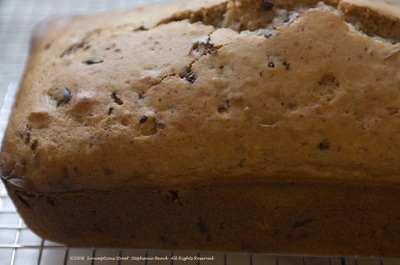 Catching an idea from overripe banana bread, I decided to make up a similar bread with my cherries. 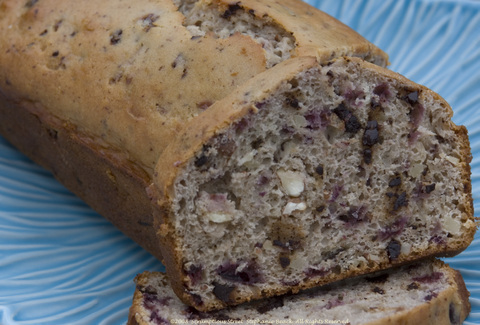 Thinking about what flavors complement the fruit, I ended up creating a wonderful "Cherry, Chocolate and Almond Bread". Although it still had a little sweetness, much like banana bread, the sweetness isn't the foreground and isn't overwhelming at all. Sure, there's chocolate in it, but I used dark chocolate which is actually somewhat bitter and of course, is good for you in moderation! I tasted all the nuts in my pantry with a nibble of cherry to find the perfect match and almonds were it! Pecans were a close second, but the cherry and almond flavors just worked beautifully together. Since this was neither a bread I'd made before nor eaten anywhere else, I am pretty proud of the results. You could use dark chocolate like I did, or bittersweet chocolate. Or, if you ARE craving something sweet, you could even use milk chocolate. It's all up to your whims, your pantry and your cravings. I found this fantastic with both coffee or teas such as green tea or chamomile. 1. Preheat oven to 350˚ F. Prepare 2 5x9" loaf pans by greasing and flouring. 2. Sift together the flour, baking powder, salt, sugar into a large bowl or the bowl of a mixer. Mix gently to incorporate all the dry ingredients. 3. Add the vanilla, egg and milk. Stir to incorporate but do not over-mix. If using a mixer, remove the bowl to add the last ingredients by hand. 4. Gently add the cherries, chocolate and almonds. Fold in to make these last ingredients evenly distributed but do not mix further. 5. Pour the dough into the two loaf pans and bake in the oven for 50-60 minutes, depending on your oven. Check at 50 minutes and when a toothpick inserted in the middle of each loaf comes out clean (except for the beautiful melted chocolate) remove from the oven. Let cool on cooling racks. 6. Slice a piece immediately and eat. The best piece is the first, straight out of the oven. For subsequent pieces, I'd suggest warming in the microwave for 10 seconds or briefly in the toaster. Just melt the chocolate but do not dry out the bread. Its moistness is incredible. Yams. I have to admit they're another food that really don't get me worked up into a happy culinary frenzy. But, like other such foods this one calls for a different approach to greatness. Maybe it's just me and after a lifetime of sickly-sweet holiday yams, I tire of having variations on the same old theme. But, I was recently in the store and saw such gorgeous yams, I threw down the gauntlet of challenge as I like to do and bought them. It was time to remove another barrier and see if I could make them delicious; anything but the same old winter/holiday yams with sugar, or molasses, and nuts and or syrup. My spin turned out spicy, flavorful, different and tasty. Here are my "Curried Yam Sticks". 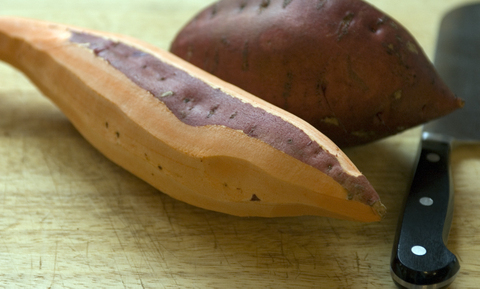 Here's a photo of the garnet yams I used, showing the transition from deep red skin to vibrant orange flesh. They really reminded me of a carrot in the raw state in texture, color and the starch that when cooked, turns sweet. In my quest to make them more interesting, I decided to cut them in a more interesting fashion than a chop or dice. So, since they evoked carrots, I cut them into little sticks, much like what most American kids are given in their lunch box and more than one party-goer has eaten from a crudité platter. Like that? Shown in the photo with the yam sticks are of course a cinnamon stick and cardamom seed pods I used as well, which you'll see in my recipe below. Sticks and stones? I composed the first photo using a wineglass and bottle for a specific reason. 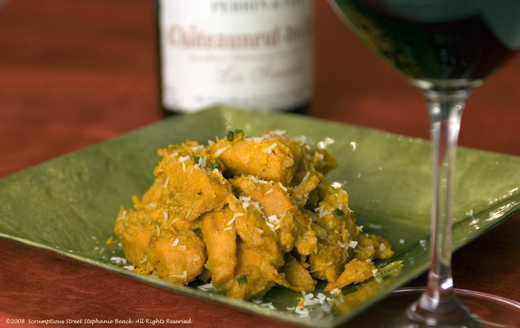 This wine was absolutely spectacular and a perfect pairing with the curried and spicy yams. I am not a wine connoisseur; someone who has true expertise. I do, however, really like wine and get thrilled when I discover one that is not only delicious but which complements the food perfectly. This wine, did exactly that. It's a 2003 Perrin & Fils, Châteauneuf-du-Pape Les Sinards. We were given it by a wonderful friend of mine, and was a treasure both for the memory of the occasion we received it and the delicious meal we enjoyed with it. So, if you're inclined, it's worth the hunt. It's imported from France by this company. I chose to steam the yams first and then quickly sauté them off at the end. They would also have been good roasted, but steaming retains more of their natural moisture and in my opinion, prepares them better to be curried. Now, on to the recipe. 1. Heat a pan with vegetable steamer over medium-high heat, bringing the water to a gentle boil. 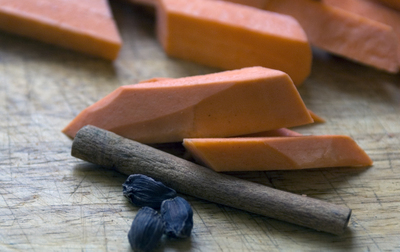 Add the yam sticks to the steamer basket and put in the cinnamon stick and cardamom pods with the yams. Cover and steam for 8-10 minutes, until the yams are just fork tender. Stir at least once during steaming, and move the spices around in the basket to help flavor all the sticks. When fork-tender, remove the yam sticks from the basket. Discard the cinnamon and cardamom pods. 2. Heat a skillet with the canola margarine over medium-high heat and sauté the scallion and ginger. After 2-3 minutes, add the yam sticks, salt and pepper. Stir and add the curry powder and ground cardamom. Stir thoroughly and if dry, add 1/4 to 1/2 cup of water, as necessary. 3. Toss in the clementine zest and juice, and gently toss together. Add the coconut, stir and then remove from heat. Serve immediately and enjoy. It was spectacular with the wine mentioned above and a flavorful and juicy roasted herb chicken. Hope you like this new spin on yams. Happy New Year everyone! I do apologize for the long break I've taken the past few weeks. Scrumptious Street became a houseful of family, holiday cheer and good raucous fun. Unfortunately, that left me no time for blogging. Mr. Scrumptious and I are a family of two. The past month we more than tripled to a household of 7! Let me say that I have renewed respect and admiration for any and all parents! Cooking for three children is definitely...different than what I'm used to. This recipe started out as one of those, "let's clean out the refrigerator" dinners but it turned into something very special and very tasty, so I must share it with you. Even though the photo doesn't look like the stew is unique, believe me, it is. I'll tell you why in a moment. But here, is my "Red Snapper Stew". The smoky flavor of the grilled corn was also another winner. So much, that I would suggest when you make this to grill any vegetables in advance. You don't have to use what I did, just use whatever you've got on hand. But, try to use a grill pan or an open flame to impart a charred flavor to at least one or two of the "sweet" vegetables you may use. It was a huge part to why this stew turned into something worthy of posting on this blog. I also made the conscious choice to use fire-roasted diced tomatoes. Once I had the smoky theme going, I wanted to build on it. You can see the black charred flakes in the photo. 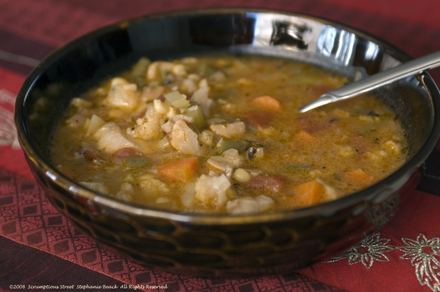 It really was part of the soup's tripartite foundation of artichoke flavor, smokiness and hearty fish. Fire-roasted red pepper would also be great in this stew. We loved it and hope you do too. Next time you make artichokes, SAVE THAT BROTH. 1. Make vegetable stock or use existing artichoke braising liquid that you've saved. Wash and prep all vegetables and fish. 2. Heat a large enameled cast-iron dutch oven or your favorite soup stock pot on medium-high. Add the olive oil and when sizzling hot, sauté the cauliflower, potato, carrots, corn and green beans. Add the salt and pepper. After 2-3 minutes, add the leeks and shallots and sauté for 5-7 minutes, until the vegetables begin to get tender and the shallots are translucent and softening. 3. Add the wine and herbs and stir thoroughly. Let the wine cook and reduce by about half to fully season the vegetables. Add the artichoke broth when vegetables are tender and the wine has reduced and bring stew to a boil. Reduce heat to a simmer, cover the pot and let cook undisturbed for 10 minutes. 4. Add the fire-roasted tomatoes to the stew, stir thoroughly and taste, checking seasoning and adjusting as necessary. Cover the pot and simmer for 15 minutes more. 5. Add the red snapper and cook until the fish is just white, opaque, tender and flaky. If the fish is fresh and your stew is hot, this should only take between 3-4 minutes. (You do not want to overcook the fish or it will turn a stiff and rubbery texture, so don't walk away to do something else!) Serve immediately and enjoy with a hearty crusty bread. Check out my business teaching cooking classes, and culinary instruction in the Seattle area.